Drop D tuning, down one half step. Tune all the strings down one half step first, and then lower the sixth string a whole step to Db. Taylor’s aggressive chordal riff. Rhy. Fig. 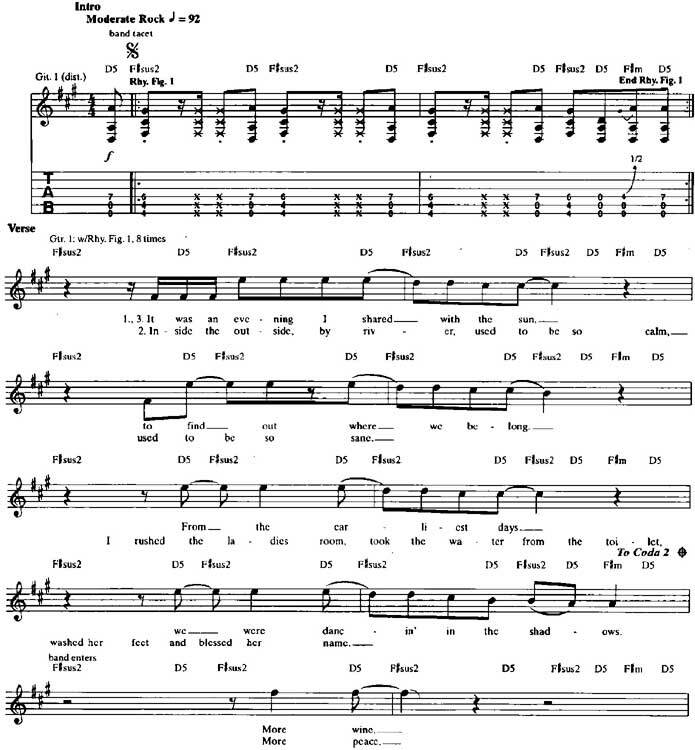 1, introduces the song and dominates the arrangement in the verses. It is an unusual fig­ure harmonically, made of two uncommon chords. D5 and Fsus2, which are facilitated by the Drop D tuning. Note that Chad plays the pattern as a widely spread D5 voicing moving to a lighter Fsus2 [Fig. 1]. This type of movement, in which the outer parts of the chords move in opposite directions, is known as contrary motion. In this case, the A on the fourth string moves down to G#, and the open D and A notes of the D5 (on the sixth and fifth strings) move up to F# and C# – a slick and inventive modern rock riff that exploits the alternate tuning to good advantage. The figure is made even more brutal by the addition of a thick, ultra-distort­ed tone and some percussive string scrapes, which produce a secondary textural element in the riff. To play these scrapes, lift off the strings with your fret hand just enough to mute the strings and muffle the notes. With the appro­priate crunchy tone, you should achieve an effect somewhere between grinding gears and a power sander. The chorus makes use of more typical root-5th power chords in Drop D tuning for Rhy. Fig. 2. Note that the alternate tuning allows the D5 to be played as two open strings and the Bb5 and G5 chords to he fretted as simple, one-fin­ger barred shapes on the sixth and fifth strings [Fig. 2]. It’s a part of Live Lakini’s Juice guitar lesson.